Our oldest son, Tyler, married Erica Gonser last Saturday and the glow of that weekend is still wonderfully warm. Kristin and I dearly wish we could have invited the entire Evergreen family to attend, but space limitations simply would not allow it. However, we hope you will share our joy as they begin their life together. We began the wedding rehearsal with prayer and I surprised a few people when I said I was not going to pray for the wedding to go well. I believed we could pull off a smooth ceremony pretty easily, but how much is that really worth? Not much. Instead, I wanted us to pray for something much more difficult and important: that every single person who came, ourselves included, would catch a glimpse of Jesus. We prayed for that and God answered. Here are just a few glimpses of Jesus I remember from Saturday. The Wait: I saw Jesus in Erica’s story of how she willingly waited for God to bring her a man who had the kind of qualities that please the Lord. Ultimately, Erica was waiting for God to bring her a true Jesus guy. The Pursuit: I saw Jesus in Tyler’s honorable pursuit of Erica. Her father gave a toast in which he commended Tyler for showing proper respect by asking him first for permission to date Erica and then later for his blessing to marry her. Tyler’s willingness to seek that blessing showed how much he valued Erica. The Vows: I saw Jesus as they spoke their vows to one another. The biblical content of their promises and the seriousness with which they took them reflected the jewel God created in marriage and the grand portrait it paints of our relationship with Christ. Erica choked up as she repeated the words of her promise and it brings me to tears as well. The Dance Contest: One of the first dances during the reception was a contest, not of great dance moves but of longevity of marital commitment. All married couples were invited onto the dance floor. As the song played, the emcee asked those married less than a year to return to their seats. The bar was then raised to five years, 10, 20 and so on to reduce the field. I saw Jesus in the fact that there were so many couples still dancing strong after 30 years. Kristin’s parents took the prize with 54 years! The Dance Jubilee: I saw Jesus as people filled the dance floor to celebrate the new marriage. The crowd of celebrants was incredibly diverse: old and young, talented and simple, wild and conservative, all moving with collective joy. I believe it was a foretaste of our celebration with Jesus when his kingdom comes. 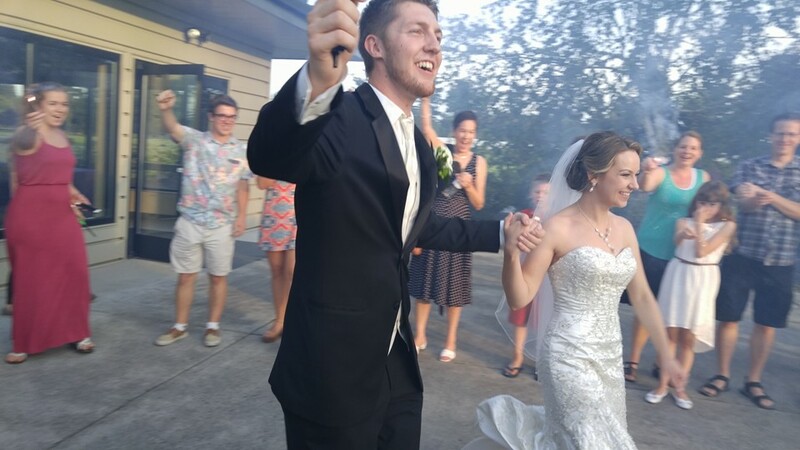 The Send Off Smile: Family and friends formed a lane of lit sparklers and cheered as they newlyweds made their way to the 1967 Porche getaway car with ‘Just Married’ on the back. The joy on their faces was priceless. I see Jesus in their joy as he delights over his people like a groom delights in his bride.